Our exciting new partnership with Dell combines CrowdStrike® Falcon® next-gen endpoint protection with Secureworks managed services to offer what Dell is calling, “the industry’s most secure commercial PC .” By combining the power of the Falcon platform with Secureworks and the iconic Dell technology infrastructure, we are delivering the industry’s most advanced threat detection and management — giving customers enterprise-level protection without the complexity. 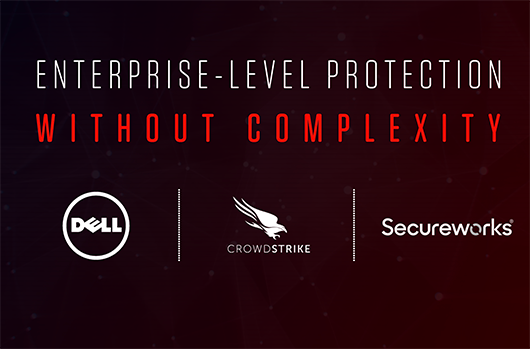 Every global business-to-business (B2B) Dell customer purchasing desktops or laptops will have the ability to add CrowdStrike through the Dell Safe Guard and Response offerings. Secureworks will offer managed service solutions around the CrowdStrike Falcon platform and will be developing innovative integrations with their proprietary security offerings. Dell will become a top-tier reseller of CrowdStrike solutions. These three go-to-market offerings will not only increase the awareness and reach of each partner involved, it will deliver best-in-breed technology and managed security to thousands of organizations in one comprehensive, cost-effective and streamlined package. The threat landscape has been evolving to match the speed of innovation: About 40 percent of cyberattacks today are non-malware based, giving adversaries ample opportunity to exploit vulnerabilities and bypass traditional AV and anti-malware technologies. The connected world has enabled global economic expansion, but also opened the door for unprecedented global breaches: The lack of available cybersecurity talent — combined with a plethora of complex, disconnected solutions — have left many organizations with inadequate security resources. The endpoint protection vendors and brands trusted for the past 20 years to protect these global innovations and organizations have become fossilized, and incapable of becoming a valid security shield for a universally connected world. These truths were also recognized by the founders of CrowdStrike when they embarked on a mission to transform endpoint protection. But CrowdStrike hasn’t been alone in our journey to revolutionize the security industry. Many of the new endpoint challengers have been offering alternative solutions — all trying to leverage the power that our new compute world offers. Customers like you have been leaning in, trying to see whether these new technologies would deliver on their promises. In too many cases, vendors were only delivering on the buzzwords they chose to describe their security solutions — not on the solutions themselves. Gartner Peer Insights Customer Choice Awards: CrowdStrike Receives Highest Overall Score in the January 2019 Gartner Peer Insights. MITRE Evaluation: MITRE ATT&CK Evaluation Reveals CrowdStrike Falcon as the Most Effective EDR Solution. CrowdStrike is a “Leader” in the 2018 Forrester Wave with the Highest Possible Score in Ten Criteria. Gartner Critical Capabilities for Endpoint Protection Platforms(EPP): CrowdStrike scores highest overall out of 21 vendors for use case Type A or “forward leaning” organizations. Gartner Magic Quadrant for EPP: CrowdStrike positioned highest among “Visionaries” for ability to execute and furthest in completeness of vision. We are delighted to partner with Dell and Secureworks on this initiative. They are showing real security leadership in providing tried, trusted and proven next-gen endpoint protection to their customers. In doing so, they are ensuring that many more organizations and individuals can confidently stop breaches. Read the Dell press release. Learn more about the CrowdStrike Falcon platform by visiting the website.